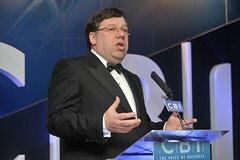 So on foot of the banking reports, An Taoiseach, Brian Cowen says that he takes full responsibility but what does that mean? Is he going to resign, is he going to decline to lead FF into the next election? not a chance! Will he forego his pay until the next election, or return his money earned as Minfin? You tell me once you get off the floor. Last night on Prime Time Cowen was bigging up his proposals in 2006 to eliminate property incentives which came into final effect in 2008 despite he becoming MinFin in 2004. So what does “taking full responsibility” for An Taoiseach actually mean? Especially, when he then says his decisions were correct based on the faulty information provided by the ESRI, the IMF, the OCED. Where did they get the info to make their projections from except the department of Finance? And who was the minister in charge of that? He constantly demands endorsement of his government’s “right decisions” after the banking crisis happened despite that crisis being large due to the decisions he made before it came about which he wants to avoid discussing as “that’s history”. So what he is telling us is that he made the correct, the logical, the right decisions based on the information provided to him by others, which turned out to be wrong but sure no one could have known it was wrong and that he himself wasn’t able to read the raw data for himself and so had to rely on the views of others as to what this information meant. So he lacked the skills to be minister for Finance but sure what did that matter cos he was the man to take the decisions! Except that when he took the decision, he wasn’t taking it so much as it was taking him. Yet FF TDs were going up and down the country telling us that we were building more houses than ever before when people raised the issue of rising house prices, did he not think that an exponential rise in building starts might constitute a bubble? We had 100% and 100% plus mortgages, no deposit required, did that not look like reckless lending to him? Did he not read a newspaper or listen to a radio ad in all that time? Cowen is like the footie manager you see on the telly who says he takes full responsibility for his teams performance but then publicly blames each and every failing in a match on his players. Or on the ref! Players he bought, trained and picked who were playing the game according to his tactics. It’s like a kid who breaks your window and says “I’m sorry” in a resentfully, snaring voice and then walks off saying he will fix it but does nothing about it. I’m analogied out but you get the picture. This entry was posted in brian cowen and tagged Banking Inquiry, brian cowen, Fianna Fail, government, Taoiseach. Bookmark the permalink.